The Personal Aid Beach Wheel Chairs for Disabled People represents a new benchmark in accessibility for less able Australians. Mango Racing has spent three years optimising the design to suit the harsh and demanding local conditions with a sharp eye on durability, flexibility and cost effectiveness. It’s designed to be used in the great outdoors, soft sand, beach surf edges, lakes, snow fields and bush trails. It features strong removable balloon wheels, folding back rests, foot rests, safety brakes with front castors 360 degree rotation, upholstery fabric UV stabilised acrylic and supports up to 130kg. The result is an outstanding local product, thirty percent cheaper than the alternative international options. Support local innovation – and purchase a Mango Racing Personal Aid Beach Wheel Chair. This year’s Mango Racing Palmy Classic was the biggest and best so far with over $15,000 worth of cash, craft and other prizes up for grabs. Now in the third year since its inception, the total competitor numbers have risen to well over 300 spread over two days of competion. The quality was also exceptionally high with Nutri-Grain Ironwomen champions Liz Pluimers and Tara Coleman battling it out with many other top levels girls for the honours in their race, whilst several local young rising stars faught it out with some experieced masters in the men’s race. The Ocean Swim and Beach races were held on the Saturday and the Endurance Ironman on the Sunday. A classic North Queensland winter morning with sunshine and warm water was the perfect setting for the Ironman Race, which started with a 9km paddle around the islands off Palm Cove. Total race distance was 21km, finishing with a 4km beach run to the Cairns Surf Club. Liz Pluimers had a comfortable win in the open ladies race, whilst yound local Max Fifield took out the open mens. Ten teams also took part in the race including competiors from 10 years old to over 60, and they all cannot wait to return to do it all again in 2015. Mango Racing’s Black Knight won last weekend’s King of the Harbour in Sydney. Katrina Wilson won the women’s division and it was the first time she had paddled the ski. Cairns Surf Lifesaving Club senior presentation night was held on Sat Nov 10th at the impressive new Palm Cove club house to finish off another year of spectacular success by the club. A perfect safety record on the beach was capped off by taking out the title of Top Club in North Australia for the 4th year running and Masters Champions for the 12th time. Major club sponsors were entertained including Mr Mango of Mango Racing who pledged his support for another 5 years. On Sunday morning the two newest and most exciting offering from the Mango Racing stable were rolled out over the golden Palm Cove sands. The Black Knight X Ocean Racer and the Waverider 2 surf spec ski hit the water with an excited crowd and a line of paddlers eager to test them out. No one was failed to be impressed with the quality of the build and performance on the water. The Waverider 2 has a excellent balance of speed, stability and maneuverability. Lengthy design work has gone into the adjustable steering system, which has resulted in the best set up in the business. It turns just like a fived length ski and will accommodate any sized paddler. The cut-away section along the seat-well is a masterstroke allowing optimum blade catch and leverage through the stroke. Combine this with a specially designed hull that gives speed, slide and glide, and you have the very latest in spec ski technology. The WR2 was thoroughly put through its paces on a 15km downwind paddle in very demanding conditions. It picked up runs of all shapes size with ease and held them exceptionally well. Control was never and issue and not a single run was lost in 90 minutes of hectic, high speed ocean paddling. Mango Racing Waverider 2 – the next step in the evolution of the racing ski. 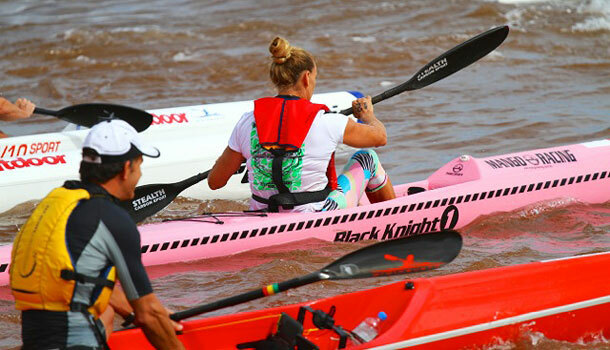 The Black Knight X was also put through its paces by a host of paddlers and the verdict was another winner from the Mango Racing design team. The way this Kayak slices through the water whilst barely disturbing the surface has to be experienced to be believed. The sleek design catches the eye of paddlers and non-paddlers alike and the performance on the water does not disappoint. Available in a range of weights, the full carbon 8.6kg model is set to become a class leader. 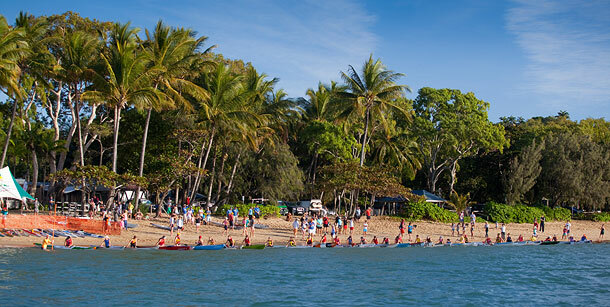 Positive feedback flowed throughout the launch and the Cairns paddling community has been left with a buzz. There is nothing mediocre about these new craft and Mango has just raised the bar. Thanks to James Marsh (Captain Cairns SLC) for this article. 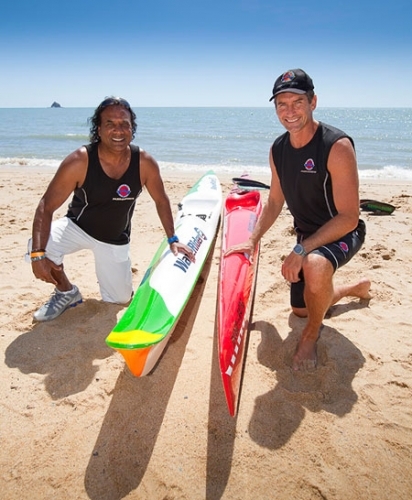 Cairns SLSC to host Australian launch of latest Surf Rescue ski and Ocean Racer from Mango Racing. Mango himself will be launching his new craft at Palm Cove with models available to test out and inspect. The racing skis are the latest and hottest items of equipment for any ski paddler. Years of design and racing experience have resulted in the Mango Racing Waverider 2, which is the next step of racing ski evolution. Fully adjustable, stable and yet frighteningly fast, the Waverider 2 offers exceptional value for money. Precision manufactured by a top quality South African kayak company, these skis are built to take gold and will not let you down. The Black Knight X1 Ocean Racer will also be on show and available to test. This sleek craft is so fast it almost defies the law of physics! Plus the multi-Australian title winning Mango Paddles – can you handle the power? We will be on the water at 7am for the usual Sunday paddle around the islands, followed by breakfast at the club and the official launch at 9am. This is a great way to start the day so come and join in. Everyone is welcome – so come and get Mangoed! Jenira Reddy is from the Marine Surf Life Saving Club in Durban South Africa. She is training hard daily to make the South African Junior Surf Life Saving Team. Mango Racing is the proud sponsor for Jenira and we look forward to her success. Mango Racing hits the road for the Championships below. We’ll have plenty of new products for you to check out, so please come and visit us in our marquee. 7 – 10 March: NSW Surf Life Saving Championships, Umina / Ocean Beach, NSW. 15 – 20 April: Australian Surf Life Saving Championships, North Kirra Beach Qld. 30 March: NSW Dragon Boat Championships, Penrith Regatta, NSW. 15 – 20 April: Australian Dragon Boat Championships, Penrith Regatta, NSW. 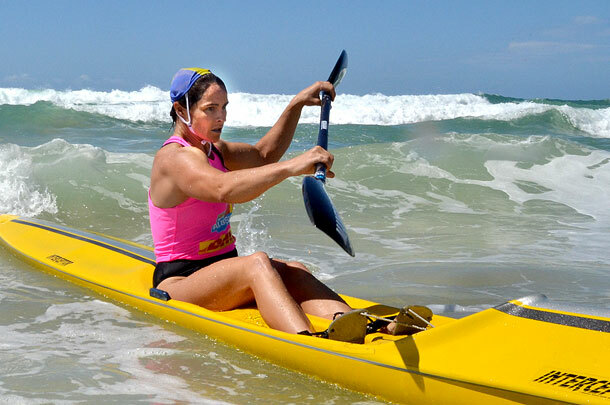 Using Mango Racing paddles, Lisa wins gold at the Masters Australian Surf Life Saving Championships 2011. John Cahill, from the North Bondi Surf Club wins a gold medal for the single surf ski race at the Masters Australian Surf Life Saving Championships 2011, Kurrawa. John has won a number of single ski races in Australia and has been using Mango Racing Sprint Carbon Paddles exclusively for several years. First ever in Australia! Mango Racing are proud to present our new Training & Development Soft Foam “Foamie” Rescue Boards. These surf rescue boards have been specifically designed for Bronze training squads and performing live rescues. Built for superior speed, strength and durability the boards use quality materials, along with closed cell foam core to ensure there is no water absorption. Mango Racing have also designed Soft foam “Foamie” Training & Development Racing Paddle Boards for junior surf life savers. Designed for safety and speed, these unique racing paddle boards are great for coaching up and coming board champions.